Just about every researcher will eventually encounter the problem of a stuck or "frozen" joint in which two pieces of glassware have suddenly become inseparable. While there are techniques to reduce the likelihood of this occuring and the researcher can try a few tricks, when all else fails he or she will turn to their glassblower for assistance. Each frozen joint presents its own "unique" problem - (cause, age, apparatus, accessibility, etc.) and range of possible solutions. Joint removal may be accomplished by using mechanical tools, chemical aids, thermal application or simple physical means. Health and safety issues may come into play if the frozen joint is the sole point of entry into a vessel and/or the vessel contains chemicals. Proper eye and hand protection is a must and the removal (if possible) of all chemicals is strongly advised prior to working on the frozen joint. Exercise extreme caution when attempting any of the methods described below. The freeing of stuck joints can be difficult - and hazardous! 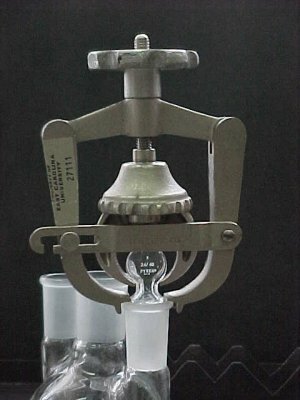 An example of a glass joint puller. This tool has a number of adjustable arms and settings making it quite useful, though a bit awkward to use. 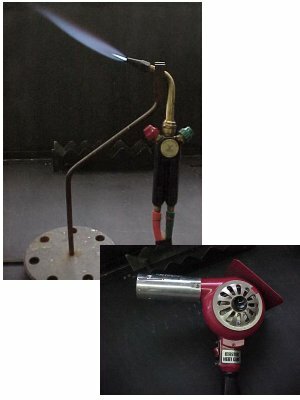 The outer adjustable arms are set to the diameter of the outer joint. The inner "claw" is adjusted by the lower wheel (center) to grasp the inner joint. The frozen glass joint is removed by rotating the upper wheel which pulls the "claw" up - hopefully freeing the frozen joint. On occasion it may be necessary to introduce a little heat to the outer glass joint - creating some expansion - to release the joint. Extreme caution should be exercised if the use of heat is required. An old stand-by - the wood stick. This method is easier if you have a helper. 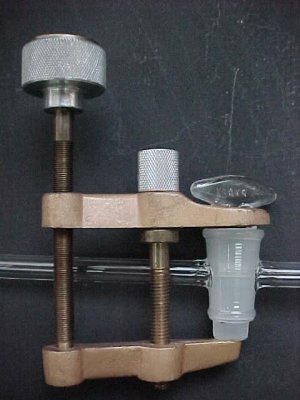 Hold the glass plug with a gloved hand (not pictured) or clamp. Using a wood stick or dowel and hammer, tap lightly but sharply against the outer joint. How hard to tap against the glass joint? Experience will be your guide - just start lightly. If you have access to the frozen joint from the bottom, you can try tapping the wood dowel against the stopper, pushing it out. Heating the outer joint may help. 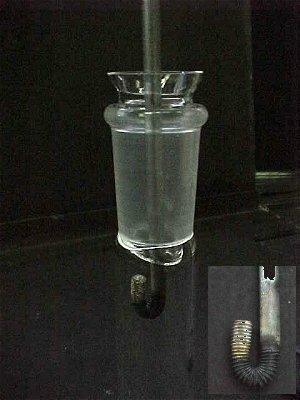 Another method used to free frozen glass joints is the application of heat to the outer joint. The outer glass joint expands - freeing itself from the inner joint. The trick is to get fairly rapid expansion of the outer glass joint without similar expansion of the inner joint. Use a torch with a moderate flame - brushing the outer joint with emphasis on visible adhesion points. Do not hold the flame directly on one spot for any length of time. This method does involve timing - too much time in the heat and you loose the expansion differential. Use insulated gloves or a hook to pull the joint free. Using a heat gun is usually not recommended. Heat guns will typically heat the outer joint and inner joint at a slower rate, therefore allowing the inner joint to expand at almost the same rate as the outer. You lose the advantage of expansion difference. Using a hook puller. Bend a metal rod into a tight bend (see photo insert). This one has been fashioned from scrap 3/16" steel rod threaded at one end. The size of the rod is not important other than it needs to be adequate for the application. You have to have access to the internal joint to insert the rod - the condenser was removed for this photo. Quickly snapping the hook up against the inner joint may be enough to free it, but experience has shown the application of heat may also be necessary. Additional tips/tricks can be found in the Glassware Gallery's section on Frozen Joints. After removing all chemicals, run the apparatus through the annealing oven. This may burn out whatever is causing the adhesion. Then try removal using any of the methods listed above. Submerge the apparatus in an ultrasonic cleaning bath. The length of time varies. Look for uniform wetting of the ground joint surfaces, indicating liquid penetration and then try the methods listed above. If the frozen parts are quite small, place them in a beaker containing an approriate solvent. 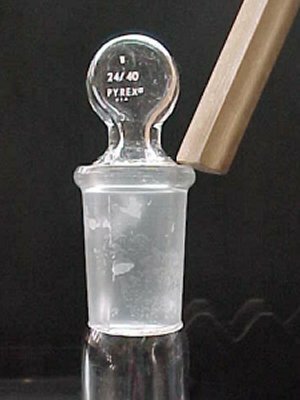 Place the beaker with the parts in ultrasonic bath containing water. Be sure the bath water height doesn't cause the beaker to float and possibly spill. Note: Using heat as an aid in joint removal is not advised when using solvents!